Lamp eats darkness and produces [black] soot! What food (quality) [one] eats daily, so will [one] produce. This shloka is a simple one, appearing in "vRiddha-chANakya" (वृद्ध-चाणक्य), but it has deeper implications. The lamp eats away the darkness. Light has always been a metaphor for good, and a lamp that of a person who does good even if it burns inside and causes its own extinction! Taking this simple observation of every day life, the poet - yes, even prose in Sanskrit is poetic, for no writings are without metaphors and a second layer of vision, that is so essential to being a poet - picks up the other side of this example. Chanakya (chANakya, चाणक्य), the wise and shrewd statesman of emperor Chandragupta (चन्द्रगुप्त) may not evoke an image of a poet in anyone, but that is because the English word poet is limited, and the Sanskrit word kavi (कवि) has been restricted in use to mean simply, 'word rhyming'. A kavi is one who has vision, s/he is a seer, feels and thinks beyond just the words! चाणक्य says that a lamp 'eats' darkness. Figuratively we all know. But even literally, for the effect of eating away the darkness the result is that a black soot is what remains when it dies out. Similarly, he says, the food we eat affects our seeds directly, both men and women. Modern medicine has been doing clinical studies and they agree on how diet can impact fertility. Marketing, hype, economics of huge corporations and market segments may not allow simple truths to reach the public, but sometimes they do trickle down. For long, among the young men, there has been a fashion of tight undergarments. A clinical correlation was established among many men with low fertility and their tight undergarments. It is simply biology, nothing else. Similarly, food intake directly affects our body. After all, exercise doesn't make the body, food makes the body. Exercise shapes the body, not make it. While the fact that food impacts our own body directly is well understood, (whether implemented or not), the fact that our food and other intake may impact our next generation directly may not be so clear. There is enough evidence now that they are related, and intake of tAmasika (तामसिक, impure, unhygienic and negative) food, tobacco, alcohol can effect the quality of the reproductive cells. There is a third level of inference from here, which is metaphoric, which I think चाणक्य may have surely meant. If not, then I present this as my inferred interpretation as a poet. The critical term here is 'birth' hinted in all words - prasUyate, jAyate, prajA etc. One thing is the physical effects on the physical birth of children after impacting our physical body negatively through bad physical food. The other is the mental food. What values we nibble for breakfast, eat for lunch and savor for dinner, what we imbibe, what we do everyday, what our children see us doing everyday, is what is going to be their mental food and making their character and value system. And the makeup and shape-up of the mind is equally important as the body, for worse than a strong mind in a weak body is a weak mind in a strong body. The latter can do much harm if gone out of control. There is a famous saying 'yathA rAjA, tathA prajA', which means 'as the king, so the subjects' and in English it is called 'Like father, like son'. See again the change of king-subject to father-son. These are related. The king, the leader is to his subjects like a father is to his children. He takes care of the food (physical needs) and character (value needs) through good effort and policies. You can see this in society or at home. It is just a matter of difference in scale. This shloka also points out one more thing. Writer should take care to give appropriate example and reader should take care to interpret an example appropriately. There could be many readers jumping up and down for defaming the great lamp, the symbol of light, sacrifice and all. Some political parties may even call for national strike or street protests in India. 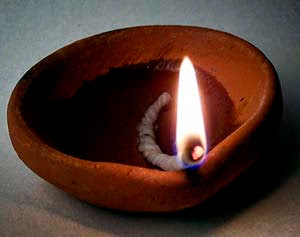 And indeed lamp is such a symbol, we light it at any function as a symbol of enlightenment and all things positive. In this sense, the writer, चाणक्य did not pick a good example. His example can be misinterpreted, misconstrued, and give the listener a reason to 'dismiss' the statement. But here is the caution to the reader. When someone gives an example, and there are many facets to it, please don't debate on other aspects. Don't do ku-tarka (false logic) and try to 'defeat' the point. Debates get biased and are a win-lose situation. Discussions are productive. So, see only that aspect of an example that the writer wishes to bring in. Here e.g. he says the lamp begets the ill results of its ill-diet, then one should not say , "But look, what a sacrifice." The sacrifice of the lamp is not being questioned or brought in for discussion. Here, the lamp eating darkness, hence producing dark soot is a different angle of the same physical phenomenon, and चाणक्य should be commended for this. Of course, he was not a big fan of being politically correct. Diplomacy was another thing. Did you notice that the word Chanakya (chANakya, चाणक्य ) appears only once in roman character? After that only appears as devanAgarI (देवनागरी). 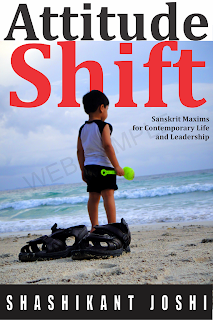 A small experiment in Sanskrit script and how fully are people reading the posts! yat-tat pair to indicate what you sow, so you reap. prajA = people, children, citizens of a nation. prajA is the result of prajanan. in yathA rAjA, tathA prajA it is the citizens. there it means the subjects, not direct biological next generation. Emphasising this, Sri Vedanta Desika, the greatest Srivaishnava Acharya, has written a grantham in Tamil -- "AkAra niyamam आकार नियमं -- explaining in detail what to eat and what should not be consumed. If possible I will send a transliteration in English. love it. follow on FB regularly..
Great work indeed ..been following your posts regularly am indebted to you for teaching the richness of devabhasha..thank you. I think this is really very good. How about permitting me to share some of the shlokas on facebook? I don't think I will be a big contributor to Sanskrit. 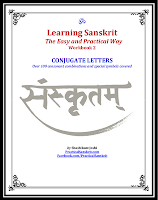 But at least my habit of quoting Sanskrit 'last liners' for supporting the point of view can be made more popular and thereby increasing use of Sanskrit. Thank you very much for the piece of information. Very informative and useful. Chankya's example was wonderful. No one has thought of this. Every one thinks of the lamp as something that removes darkness. But how does it do it? It eats it away. Great! Amazing !! Will follow regularly.